Berliner Pub in Renton, WA…it’s where it’s at. This is where you’ll find the best Bratzel around (soft pretzel). Order it with cream cheese and a beer to make it a real treat! 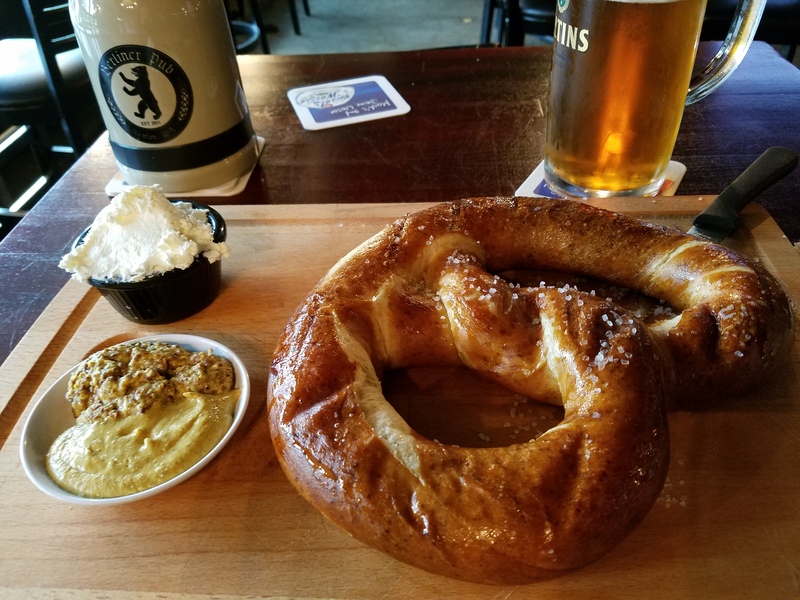 Berliner Pub is a great spot to meet up with friends, co-workers, to catch the Seattle Sounders game, order Schnitzel, Sausages, and more. The menu offers up some excellent options. Bar. Wurst. Biergarten. It’s time for Seattle Beer Week! Celebrate in the Seattle area with a variety of events May 12th – 22nd, 2016. There’s a great many locations for a tasty beverage. See http://www.seattlebeerweek.com/ for all the info. On your next adventure to Victoria BC, check out the newest food truck, Songhees Seafood and Steam. In a collaboration between Clipper and the Songhees Nation, they’ll be serving up a modern take on Pacific Northwest fare. Cuisine rooted in cultural heritage with fresh local ingredients. Chef David Roger has crafted an authentic menu that includes salmon, bison, and more. Grand opening is May 12th and is located at the Victoria Clipper Terminal at 254 Belleville St. Great location for a tasty bite! What makes for a fun outing to prepare for a Mother’s Day feast? Head to downtown Seattle to Pike Place Market’s annual Flower Festival ~ that’s what! Whether you make it for a few hours or all day, grab a bite and support the locals. Flowers. Halibut. Broccolini. Shiitake Mushrooms. Pork Hom Bow. Chocolate. Sunshine. Check it off your list of May events. Done.